The Embassy of the Republic of Slovenia Budapest was opened in 1992 as an official representative body of the Slovene Government in Hungary. As independent states the two countries officially established diplomatic relations in 1992. The embassy provides consular assistance and promotes bilateral political, economic, and cultural relations. The Embassy of the Republic of Slovenia Budapest is responsible for Hungary and also for Bulgaria. The two neighbouring countries have extensive cultural cooperation also due to the needs of Slovene and Hungarian minorities living in each respective country. The legal basis for bilateral cooperation is the bilateral agreement in the fields of science, education, and culture, signed between the two states in 1992. The Slovene minority, consisting of about 3,000 individuals mostly living in the Raba region in Hungary, enjoys a limited level of bilingual acknowledgement. In addition, Slovenian language is being taught at Loránd Eötvös University (ELTE) in Budapest and at University of Szombathely. There are also several Slovene cultural organisations based in Budapest and in the Raba region. In Bulgaria there is a Slovene language lectureship at Saint Clement University in Sofia. Bulgaria is also a co-founding state of the Forum of Slavic Cultures International Foundation, based in Ljubljana, Slovenia. Together with Eötvös Loránd University from Budapest the embassy co-organised a celebration in December 2013 on the occasion of the 200th anniversary of Franc Miklošič's birth. The commemoration of the Slovene philologist was marked by a documentary film produced by the pupils of the Franc Miklošič Gymnasium from Ljutomer. The same year, the embassy hosted a photo exhibition by Stane Jagodič and Marko Lipuš, organised by Ljubljana's Photon Gallery. In 2013 the embassy helped to co-organise a reception for the guest appearance of Gregor Luštek's and Rosana Hribar's dance performance at MU Szinház in Budapest. 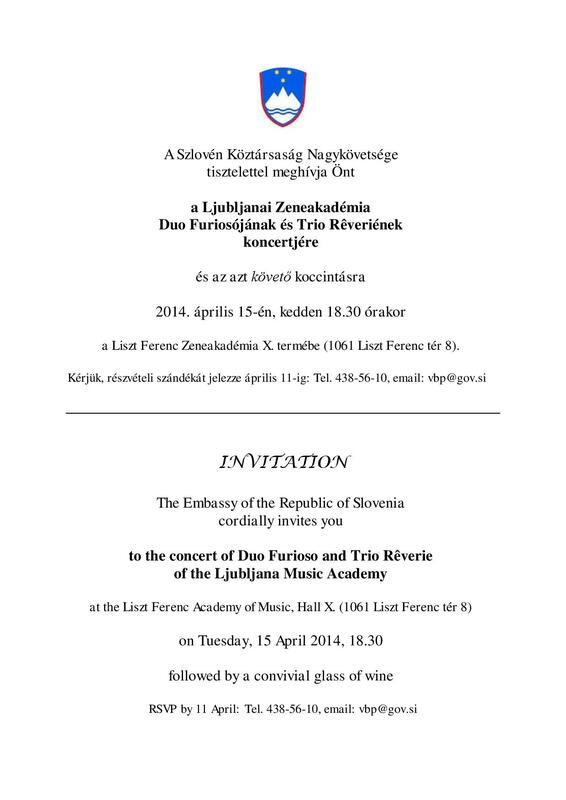 The same year the embassy co-organised an evening with Slovene actress Polona Vetrih, a guest appearance of the classical music ensemble Trio Barcarola, and a concert by Vlado Kreslin. Every year, together with the Franz Liszt Academy from Budapest and the Academy of Music from Ljubljana, the embassy organises a concert in order to strengthen the ties between the two institutions. In 2014 the concert was performed by Trio Rêverie and Duo Furioso. This page was last modified on 16 October 2017, at 11:22.